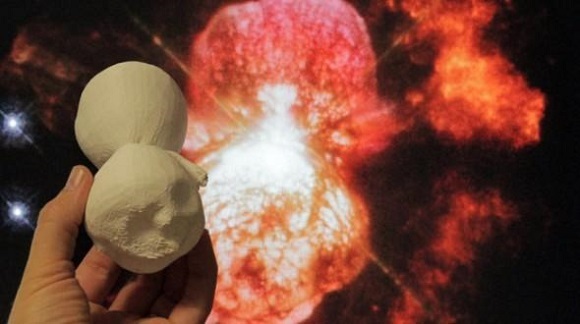 NASA researchers have managed to map the whole Eta Carinae Homunculus Nebula and also 3D printed 3D expanding nebula it produced as a result of a 19th century outburst. Eta Carinae is one of the largest binary systems for astronomers to explore in detail. It lies at a distance of 7.500 light-years from the Earth in Carina southern constellation. The smaller star is 30 times as big as the sun and can even be million times brighter and more gleaming. The primary star gives off the energy 5 million times more intense than the sun’s energy and consists of about 90 solar masses. In the 19th century the large binary system Eta Carinae suffered an intense eruption that emitted 10 or even more times the mass of the sun. That’s how it became the second brightest celestial body. This incident is called the Great Eruption. In the result of the event a gaseous shell was thrown into space. 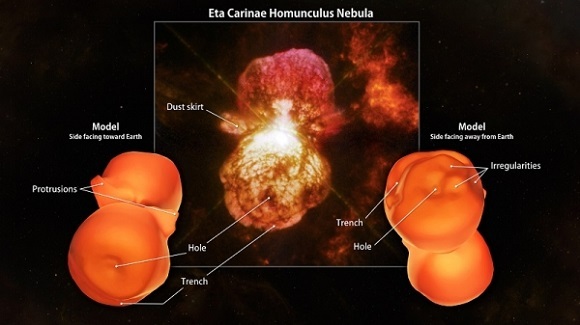 The material makes up a cloud filled with dust called Homunculus Nebula. It’s about one light year long and it grown on at 2,1 million km/h (1,3 million mph). These days a group of astronomers used the Very Large Telescope from the European Southern Observatory and its X-Shooter spectrograph to develop the first 3D model of Homunculus Nebula of high resolution. The team needs this model to explore even dust-hidden parts of the nebula that are not visible from the Earth. To study and mold the 3D motions and nebula construction the scientists used Shape – a modeling program. They say that their model shows that this huge dust and gas shell is of more complex origin than they had expected. 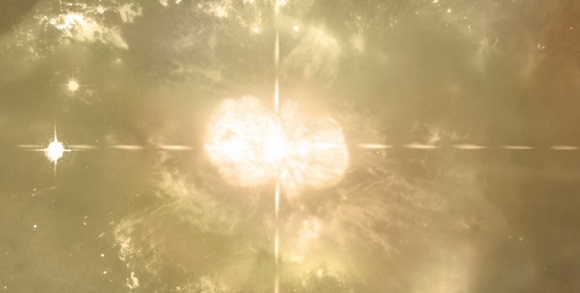 This is the first time they’ve suggested that powerful interactions among the stars play such important role in making up the nebula they deal with today. As soon as the scientists have made up their Homunculus model, they made one step further – they managed to 3F print a physical model. Goddard astrophysicist Theodore Gull explained that nowadays with free access to 3D printers they can make up their own variant of such an object. 3D printed models of such objects can be a good option for everyone interested in astronomy to study celestial bodies. Others view them as an indispensable way for the blind to compare astronomical images with scientifically exact descriptions of real objects.